Japanese Episode AG 059: "Kinsetsu Jimu Futatabi! VS Raiboruto!!" American Episode 331: "Manectric Charge"
On the way to Touka City, our heroes pass through Kinsetsu City once again. Since they last left the city, a carnival has opened, so Satoshi-tachi decide to enjoy themselves for the time being. However, it turns out that the carnival is being run by the Rocket-Dan, and that all the games are merely traps designed to capture our heroes' pokemon! Tessen and his assistant, Watt, arrive in time to defeat the Rocket trio with their electric-type pokemon, gaining enough experience for Tessen's Rakurai to evolve into Livolt in the process! Satoshi wants to battle Tessen again with his new pokemon, Cotoise, and so a rematch is agreed upon. However, first up will be a battle between Haruka's Eneko and Watt's Denryuu. Haruka seems to be having trouble keeping up with Denryuu's power, but it is able to pull through with a victory. Next up is the main event; Satoshi's Cotoise vs. Tessen's Livolt! Satoshi orders his pokemon to use Overheat over and over again, unaware that the attack's power is decreasing with each attack. After Livolt has used Charge to store a great deal of energy, it unleashes an attack that is powerful enough to knock out Satoshi's newest pokemon. Satoshi concedes defeat, taking with him a lesson about being too dependent on a single technique. After the battle, Watt tells Haruka that there's a Pokemon Contest in Shidake Town, so it is decided that the gang will head there before returning to Touka City. After Tessen's rather embarrassing defeat nineteen episodes ago, it's nice to see him get his revenge in this episode. It was a good rematch too, and it's nice to see the anime tackle game mechanics like the fact that Overheat's power decreases with each use. I thought Watt's sudden interest in Haruka seemed a little out of left field, but otherwise it was a great episode. The dubbed version fell prey to that law about commercial goods again, and 4Kids went a little bit crazy with the time cuts, but other than that this episode wasn't anything special. 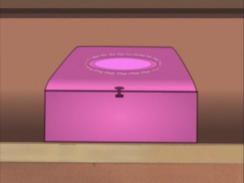 You know all the ribbon cases and jewelry that Team Rocket was offering as prizes at the carnival? Well, originally, those boxes and necklaces were all pokemon plushies. You can view more images here. As you can see, the ribbon case that May wanted was an Achamo doll in the original. This edit was probably made because of that law prohibiting the advertisement of real products in kids' shows. I understand the necessity for an edit like this, but that doesn't mean that 4Kids has to make it look so crappy. 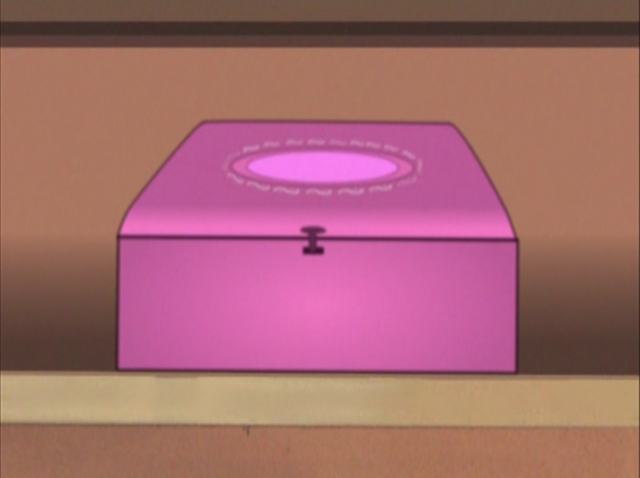 The way the ribbon case is shaded doesn't match the animation style at all, and it looks like it would be more at home in a Sealab 2021 episode than it does here. 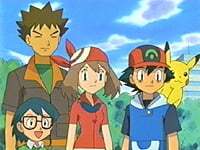 In the Japanese version, Pokettaari Monsutaari (the last ending theme used for the original Pocket Monsters series) is heard while everybody plays the various games at the carnival. In the dub, this is replaced by 4Kids' random background music. A second is cut from the first shot of Tessen's gym. Haruka screaming for her Eneko after it gets hit by Denryuu's Iron Tail is shortened by a second in the dub. Two seconds are cut from the shot of the smoke clearing after the above cut. 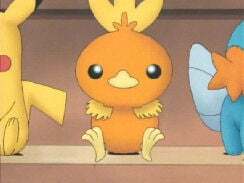 The third opening theme to the original series, OK!, is played in the Japanese version at the start of Satoshi's fight against Tessen. The music plays until the scene with the Rocket-Dan stuck in a whirlpool, and then resumes when we cut back to the battle. Of course, the dubbed version replaces the vocal song with their own background music like they do with every other vocal song that appears in the show. Another two seconds are cut from the pan shot featuring Tessen and Watt as the narrator talks about what the gang will do next.